A lot happened at US Open …… the men’s defending champion walked out with an injury …… the strong contenders Roger Federer and Novak Djokovic were swept aside and it going to involve two unexpected finalists - one of them is the first Japanese, and indeed Asian, player ever to reach a grand slam singles final – a man born in Matsue in Shimane Prefecture in Japan, listed by Forbes as the 10th highest-earning tennis player in 2014, having raked in $11million - $1.5m from prize money and $10.5m from endorsement deals with the likes of Uniqlo, Adidas, Wilson and Tag Heuer. This will be the first US Open final between two players making their Grand Slam final debut since 1997 when Patrick Rafter defeated Greg Rusedski. That was also the last US Open final without a Top 10 player. Rafter was ranked No. 14 in the Emirates ATP Rankings and Rusedski was No. 20. The prize money at tennis grand slams has increased rapidly in recent years, particularly after players demanded a bigger share of the revenue pie. After the increase in other major tournaments, at US open - $3 million is to be awarded to both men’s and women’s champions at the U.S. Open ~ and for Serena Williams, prize money boosted considerably by having won the U.S. Open Series. Designed to add interest to the tournaments that take place in North America in the run up to the year’s final Grand Slam, the Emirates-Airline-sponsored U.S. Open series offered increase their paycheck by $1 million for player who adds US open to their kitty. In Men’s it could not happen … then Japanese Kei Nishikori beat Novak Djokovic in four sets and a rumbling thunderstorm by mere minutes to reach the final. Nishikori has not won the title yet – now has a chance to beat Marin Cilic……… last year I had posted on the exploits of the twins – who at 35, left only a few records. Robert Charles Bryan (Bob) and Michael Carl Bryan (Mike), have won multiple Olympic medals, including the gold in 2012 and have won more professional games, matches, tournaments and Grand Slams than any other pairing. Now, they have won their 100th tournament title. 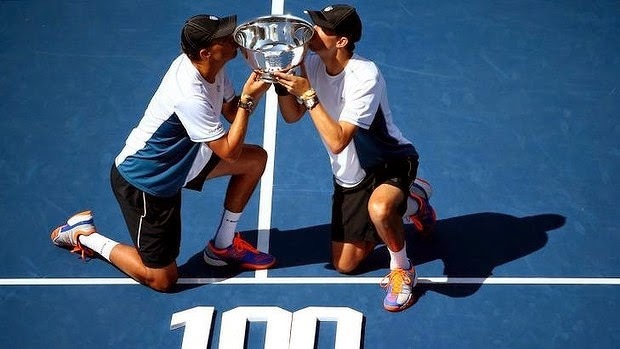 They have now tied a record with their fifth U.S. Open men’s doubles title. Richard Sears and James Dwight also won five way back in the 1880s. They played their first tournament at age 6 in Agoura Hills, California, and have come a long long way.. Cilic is the first Croat to reach a Grand Slam final since coach Goran Ivanisevic won Wimbledon in 2001; Nishikori has beaten three Top 10 players en route – No. 6 Milos Raonic (4R), No. 4 Stan Wawrinka (QF) and No. 1 Novak Djokovic (SF). In the Womens – Serena Williams steam-rolled past Caroline Wozniacki - 6-3, 6-3 winning her sixth US Open women’s singles title, which ties Chris Evert for the most in the Open era. She won her 18th Grand Slam singles title, which ties Evert and Martina Navratilova for fourth-most in tennis history (behind Margaret Court’s 24, Steffi Graf’s 22 and Helen Wills Moody’s 19) and is second in the Open era (behind only Graf). Wozniacki, the No. 11 seed, had twice taken Williams to three sets this summer, in Montreal and Cincinnati, but had only beaten her once in nine career head-to-heads. Appropriately, Evert, along with Navratilova, was there after the match to present an emotional Williams with a special memento to mark her achievement — an 18 karat gold Tiffany & Co. bracelet. Eighteen karats for 18 Slams.